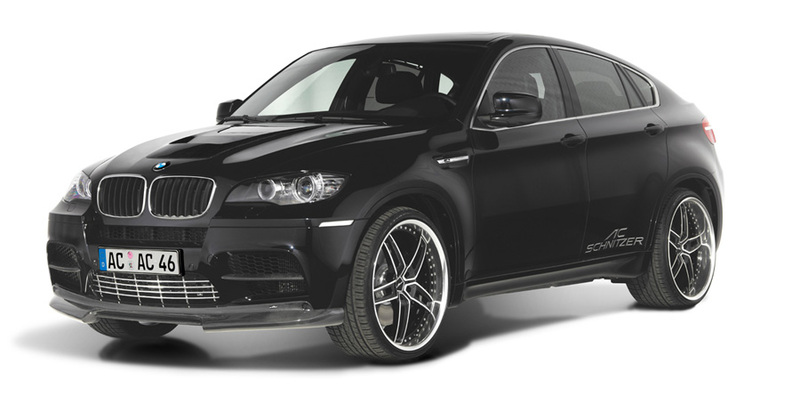 Giving the X6 M the looks to suit the twin-turbocharged V-8. Based in Aachen, Germany, AC Schnitzer has achieved decades of motorsport success with BMWs. The knowledge gained from the company’s racing success has transferred into road cars with enhanced performance and functional designs. The new AC Schnitzer styling package for the BMW X6 M is no different, featuring numerous aerodynamic and interior upgrades that flaunt the M’s power. 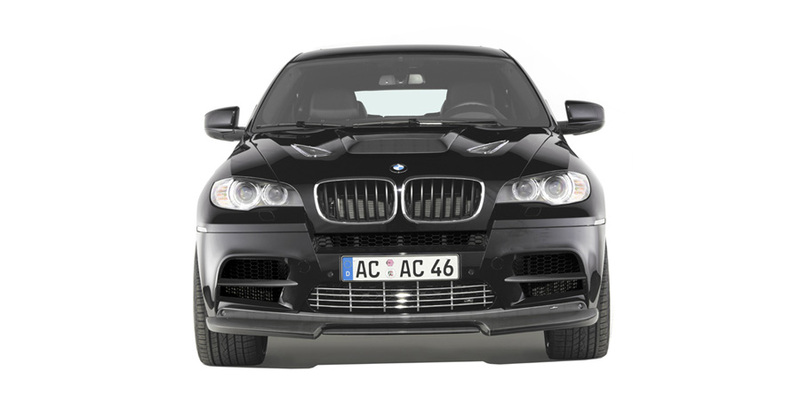 Distinguishing itself from an ordinary X6 is the striking face of the AC Schnitzer X6 M. Fitted with a new carbon front spoiler to reduce aerodynamic lift, the M also sports chrome and carbon fiber design elements for a distinct look. 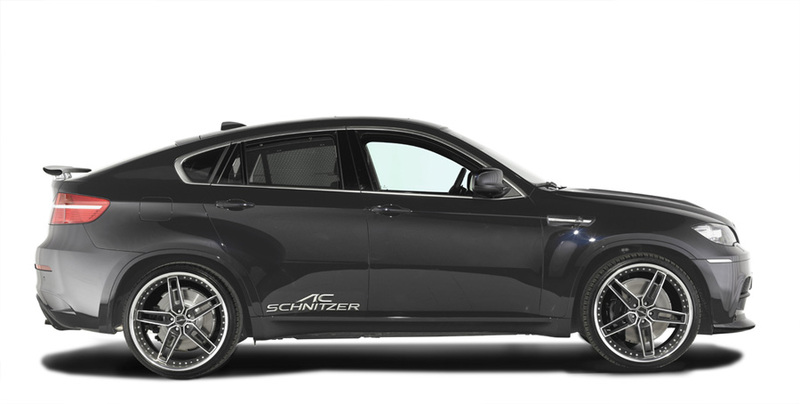 AC Schnitzer also can install a plexiglass panoramic window in the hood to display the twin-turbocharged V-8 that can be dressed with the optional carbon fiber styling kit. Alongside the window, customers can order dual hood vents with chrome webbing. 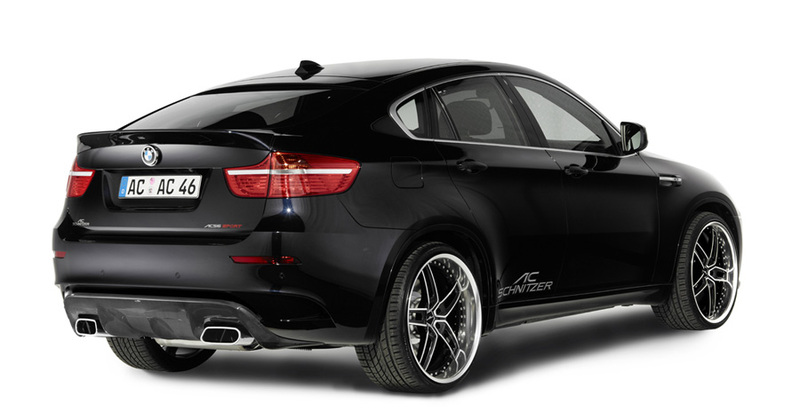 At the rear, the X6 M is fitted with a number of aerodynamic options. Both the roof spoiler and rear spoiler give the X6 M greater stability at high speeds. 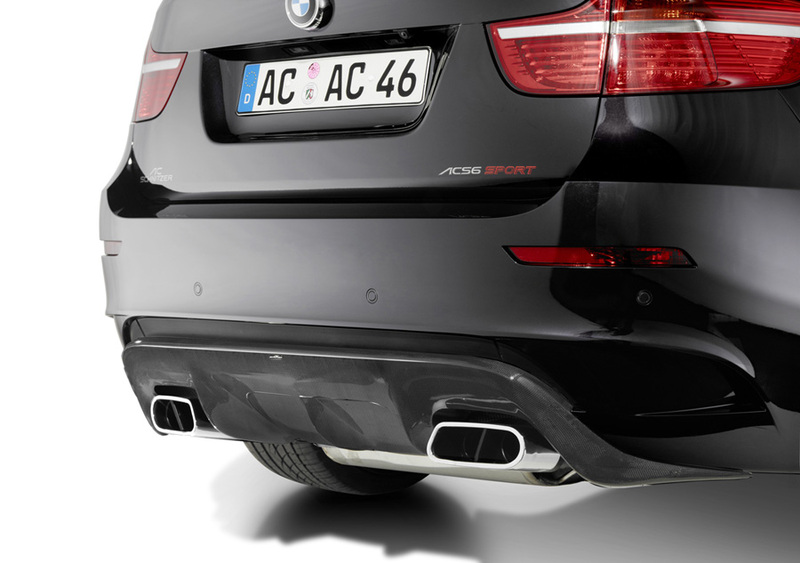 The X6 M is also equipped with a new diffuser that creates a low-pressure area under the car for better handling. 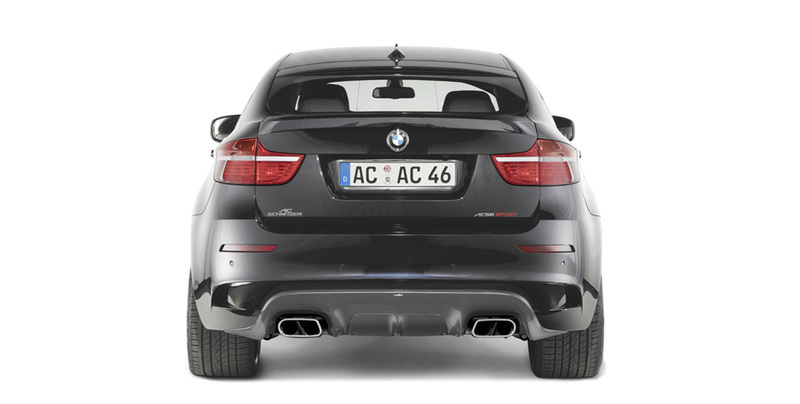 A new rear muffler with chrome exhaust tips completes the rear styling. Further giving the X6 M a muscular appearance are wheel arch extensions, widening the body by 40 mm (1.57 in.). The extended arches allow for new 20, 22, or 23-inch AC Schnitzer Type VI, V, VII, or VIII wheels. Sporting 275, 315, 295 or 335 tires, the wheels can be finished in silver, black, or BiColor for a unique and athletic appearance. 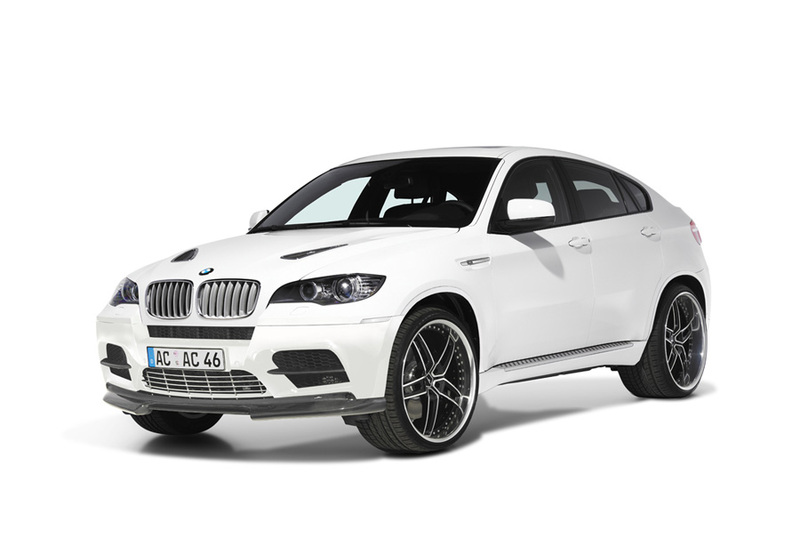 The distinct and sporty exterior character of the AC Schnitzer BMW X6 M continues in the cabin. Both the steering wheel and interior trim are dressed in carbon fiber with the new “black Exclusiv” design. Facing the driver is a new instrument panel conversion featuring white gauges, red lighting, red indicators, and the AC Schnitzer logo. Alongside the carbon fiber gear knob is an aluminum cover for the i-Drive system in the shape of a wheel. The cockpit is finished off with an aluminum footrest, pedal set, and velour floormats. AC Schnitzer offers both individual and complete styling kits for the X6 M. Currently the tuning company is developing a performance package for the X6 M. Pricing and ordering information for the AC Schnizter BMW X6 M can be found at http://www.ac-schnitzer.de/en.